Once the core has been cut into sections on the catwalk, it is brought into the core lab. The first order of business is letting it warm up. This rack holds the cores as they warm. After a few hours, it is run through several machines that measure its physical properties, including a thermal conductivity measurement (sensor is placed into the core in the black insulating tube. Then the fun begins (at least for me). The cylinder of rock is sliced in half. When it is soft sediment, a giant cheese cutter is used. A wire is wrapped around the knobs on the contraption of the lower picture. For the harder sediment and hard rock, a water saw is used, at the far end of the picture. Half of the core is for the archive and it goes through one set of steps. The other half is the working half where samples are collected for shipboard and home institution sampling. Both haves are sent back to the IODP Depository. The archive half is photographed and described. Gillian here has tasted the sediment to figure out the grain size. The description is per layer of material. Two scientists work together, one describing and the other recording the information into the central system. Sampling is very important to the science team, because these are the samples that they get to bring back to do further tests. Structural geologists measure all the angles if we find any faults. Bins and bins of samples to take home. 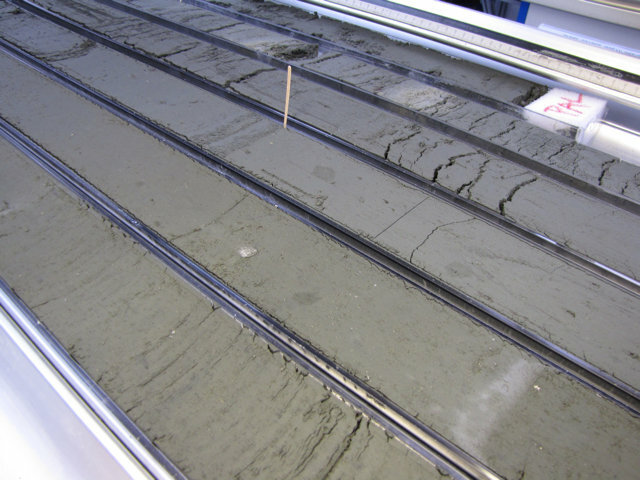 Once we reached the basement cores for processing, sampling came to a dead halt. Right after lunchtime when both shifts of scientists were awake, all the cores were laid out and everyone got to place their stickers on the rocks that they want to sample.